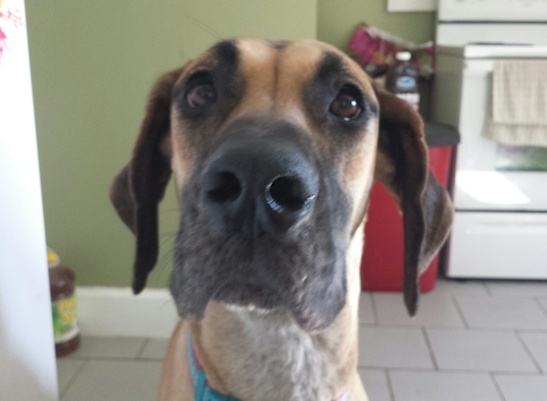 Daisy is a one year old Great Dane female with some self esteem issues. Her owner contacted me for help with a number of behavioral problems; fear of new people – specifically men. Not respecting her owner’s personal space or authority, inconsistent when following commands or corrections and pulling on the leash. As soon as I arrived for the session I could tell this was an insecure dog. She barked, then cowered or ran away, paced in circles and was clearly agitated and stressed. I completely ignored her as I discussed the situation with her owner. I remained as still as possible, avoided all eye contact and adopted a relaxed body pose. It took a few minutes, but eventually Daisy came over to give me a good sniff. When I work with an insecure dog, I always try to incorporate some basic skill training. I believe that dogs feel a sense of pride when they master a new skill and that’s a great way to start building up confidence. Her owner told me that Daisy didn’t really know any commands, so I took out some high value meat treats so we could work on the basics. I started with the sit. Its a super basic exercise, but helps put the dog in a subordinate role and gives the owner a great structured way to provide positive reinforcement. Because she was so nervous, I held a meat treat out to the side with my palm up. Once Daisy approached, I slowly raised my hand upward and at an angle towards her back. This causes a dog to look up to follow the treat, which usually helps them ease into a sit position. Daisy backed up before sitting down. At first I thought she was trying to increase the distance between us, but because they have wood floors and Daisy was moving to a spot covered by a blanket or doggy bed, I moved closer to the covered floor and tried again. It took a minute and a half of coaxing, but I was finally able to get her to sit down. As soon as she did, I offered the high value treat and repeated the command word “sit” a few times as she chewed. I repeated this process several times. With each repetition, Daisy sat faster and showed much better body posture and movement. By the end of the exercise, she was clearly carrying herself with confidence and seemed to be enjoying herself. Because she rarely sat on command before our session, I suggested that her owner repeat this exercise several times over the next week or two. Next I went over how her owner can claim her personal space when Daisy gets too close or paws at her for attention. Its important to avoid punishment when dealing with an insecure dog. They respond much better to earned positive reinforcement which is why working on basic commands through reward training is so beneficial. At the same time, its not reasonable to ignore a dog who is pawing at her owner in an attempt to demand attention and affection. Her owner had been putting the dog in the kennel when she got out of line. While removing the dog from the situation or stimulation its reacting to can stop the behavior, it doesn’t help the dog learn to get over the fear. In extreme cases, thats the way to go. But for more moderate outbursts, I suggested that she simply put the dog on a leash. Sometimes putting a dog on a leash causes it to stop attempting to take a leadership position or to take a more subordinate role. If not, the leash allows the owner to correct the dog with a quick, well timed tug. By correcting or disagreeing with unwanted behaviors as soon as they happen, we can help communicate to the dog the things we don’t want. Combining that technique with positive reinforcement that builds up Daisy’s confidence will increase trust and lead to better interactions between dog and owner.